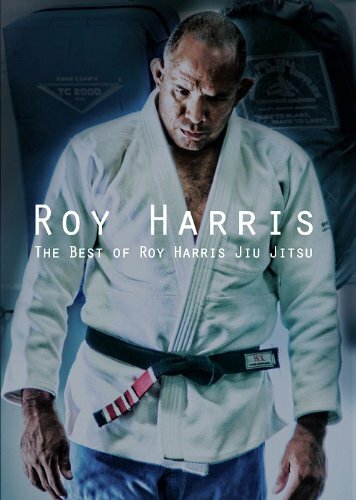 Roy Harris has a great instructional DVD specifically targeted to the OMJJ's over 40 years old (Volume 3 of the Brazilian Jiu Jitsu: The Best of Roy Harris). When I started BJJ, it was very difficult to keep at it. Being very out of shape, I would get very winded. Gassing combined with little moves to use, I was like a big fat wrestling dummy for the youthful ones to beat on. After class, all I could muster was laying down (and moaning). The more practical techniques I learned, the easier BJJ became. I wish that I had watched Master Harris's DVD sooner. The apparent lack of information/technique geared to the older player is an original reason that I started this blog. This DVD gives a great blueprint to start BJJ, regardless of age. Even after you have a foundation, it still has many lessons to offer. One thing is totally apparent when you watch the DVD. Roy Harris is a master teacher. He really has a passion for educating and has the skills to be clear, concise, while covering a lot of information. His voice sounds a bit like the Saturday Night Live skit, Deep Thoughts by Jack Handey. However, this may not be so much of a laid back demeanor, but a method of teaching to make it easier to listen to his lesson. I don't know. I wish that I would have asked him. Master Harris was kind enough to answer a few questions about the DVD and its targeted audience. 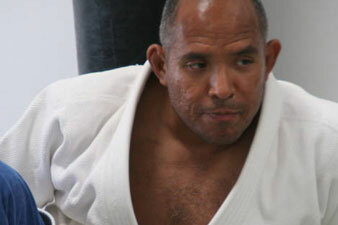 Master Roy Harris is a Fourth Degree Black Belt in Brazilian Jiu Jitsu under Professor Joe Moreira. He was one of the Dirty Dozen, the first 12 non-Brazilians to get their black belt in BJJ. He has trained with the Who's-Who of the sport: Rorion Gracie, Royler Gracie, Rigan Machado, Jean Jacques Machado. His BJJ school is the Harris Academy in San Diego, CA. Master Harris has taught hundreds of seminars in 24 countries for companies, police and military, including special forces from Poland, Slovakia, US Marines and the US Navy Seals. He even instructed the Anheuser-Busch "Bud Girls." Ay, chihuahua! 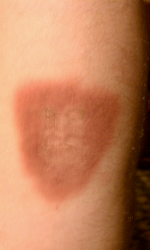 The DVD covers theory, i.e., protect yourself and make your opponent do all the work, and has a lot of practical positions and techniques. He goes through basic concepts of fundamental movements and positions, before getting into techniques. The detailed explanation of "fundamental" positions and movements goes beyond what you would see in class, although they are basic concepts. He makes it easier to grasp by combining explanation, followed by demonstration, and then a powerpoint-style wrap up of why the moves are important. One of the more "controversial" techniques is to grab your collar when mounted or in side control and wait for your uke to give some space and then sweep or recover to guard. As Master Harris explains, "Basically you use this defensive position to get them to uncross their ankles. Pretty sneaky, huh?" I have used this one especially when I gas out. People rightly think it is stalling, but that is OK. I talked about stalling and why it was common in BJJ with Master Dave Trader (my Master where I train). Dave explained, "BJJ has a history of very long or even no time limit matches. So, the tolerance for stalling is much higher than in wrestling or judo which have short time limits. Also, the focus on achieving dominant position requires you to not rush. Rushing to achieve a sub or position can cause you to lose position and possibly the match or fight." Master Harris uses the defensive positions as a "wise man's" technique. Why try to match the superior strength and endurance of a younger opponent? It is a losing battle. Let them do the work, get frustrated, screw up and then sweep or improve your position. The most difficult thing that I have with using his approach is being pragmatic and defensive. After realizing you gave up mount or an opponent has got your back, I am in panic mode. I am not thinking, OK, get you defenses and wait for him to screw up. I am not in the mode to think defensive, but that is more a symptom of my lack of maturity in the sport. Hence, why I am a white belt. Master Harris points out that defense prevents injury by reducing the number of times that you get tapped out. In one example, an aged student went from 10-20 taps night to 10 a week. As he states, "You like that word "survive", huh?" The technique portion of the DVD is also very good with some neat bemt armlock approaches (without movement), good submission escapes, etc. He wraps up the DVD by showing sparring and "playing," a less than full speed sparring that focuses on trying techniques. I sometimes can get out of the survival mode sparring and get into the "playing" mode with the upper belts, but that is also a level of maturity in BJJ that comes with experience. he adds, "Its not about who taps who. The focus of training is to learn." OMJJ: You explain in the dvd that these techniques are for the occasional BJJ practitioner that has a family, job, greatly needs to avoid injury, and wants to have fun with the sport. Are these techniques not right for competition? MASTER HARRIS: While some of the techniques and tactics can be used for competition, it must be remembered that competition isn't the only aspect for Jiu Jitsu. While there is the competition and self-defense aspect in Jiu Jitsu, there is also the playful, hobbyist's aspect. Each aspect requires a different mindset to be useful. It must also be remembered that there are a lot of Jiu Jitsu practitioners that are not interested in competition. While most of the Brazilian Jiu Jitsu that is taught in this country is competition oriented Jiu Jitsu, there are a lot more hobbyists now-a-days. This is the reason why I developed the Over 40 DVD! "Don't believe the lie that says, 'You're wussing out if you don't train hard.' That stupid mindset is for twenty year olds who have very few responsibilities in life!" 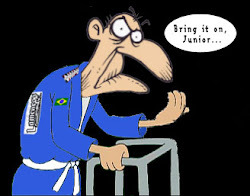 OMJJ: What advice do you have for the older BJJ noobs to get the most enjoyment out of the sport and keep at it? 1. Not all instructors "get it." They do not understand your needs. So, shop around town until you find someone who gets it! 2. If you can't find an instructor within a reasonable driving distance, start a training club in your own garage. Take three to six months to find the right people. A group of guys in the 40's and 50's decided to do what I had asked of them ("train on your own outside of the academy environment" - because that's where your progress will occur). They started their own training group in a couple of garages. Over the course of a few months, they trained in secret, not telling anyone what they were doing. They focused exclusively on escaping from the mount and side mount positions. Several months down the road, many of the young guns started to notice they could no longer hold down the old guys. Of course, the young guys started asking questions. The old guys told them they were training one day a week at this guy's house and one day a week at that guy's garage. Of course, the young guys wanted to cash in on this newly found resource. So, they asked the old guys if they could join them. The old guys said, "No." There's more to the story, but I am so happy that (a) the old guys got together on their own and trained outside of the academy environment, and (b) they said "No" to the young guns! 3. If you don't want to do either of the above, then you need to be vocal at your young gun training facility. You need to tell the other students, "My back is giving me problems today. So, don't go hard with me!" You also need to tell the spazzes at your academy "No" when they ask to roll with you. Speak up and let your wishes be known. Don't believe the lie that says, "You're wussing out if you don't train hard." That stupid mindset is for twenty year olds who have very few responsibilities in life! OMJJ: At your school (Harris Academy in San Diego, CA), what percentage of white belts are over 40? MASTER HARRIS: The over 40 crowd represents around 5% of the students at the Harris Academy. Over the years, I've had guys in the middle to late 60's training with me. My oldest student was 73 years old. He trained with us for a year! OMJJ: Are there any different approaches that you take to help the Over 40 BJJ beginner get started in the sport (versus approaches for the younger student)? MASTER HARRIS: For starters, a male who is over the age of 40, and just starting Jiu Jitsu, needs to understand that he is no longer a twenty year old. He needs to accept the fact that his body is "more mature" (which means it will take much longer to heal) and that he has responsibilities outside of the classroom. Second, he must focus on his priorities. Why is he there in the first place? He's there because he wants to get in shape and learn a bit of self-defense. So, focus on getting in shape and learning a bit of self-defense. In other words, turn a blind eye to the competition team. Forget about the fact that you used to be a decent wrestler. Forget the good ol' days of competition - how you long for them…..or how you'd like to see how you might do against one of the really good guys at the academy. Third, have periodic talks with your instructor. Make him responsible for your safety. Place "some" responsibility upon his shoulders. Tell him your expectations and ask him if he is willing to meet you half way. Over the years, I've had all kinds of people come and train with me. Two gentlemen who came to train with me were surgeons. Each one pulled me aside and said, "Just so you know, I am a surgeon. I depend on my hands for my work. I need you to protect my hands during class. I am relying on you to help me accomplish this goal. Can you do that?" My response was, "Yes. I will help you accomplish this goal." Long story short, I watched them like a hawk. Any time they were about to begin sparring with a "spaz", I changed their partners. Other students wondered what I was doing, but my surgeon students knew. They were very appreciative! Thanks so very much, Master Harris. It is going above and beyond to take the time to help us Over 40 Practitioners learn from your experience. It is people like you that make this sport so great. You can buy his 3 DVD set directly from Roy Harris www.royharris.com or from other retailers. It is also available as an iPhone App. It is very OMJJ Approved!